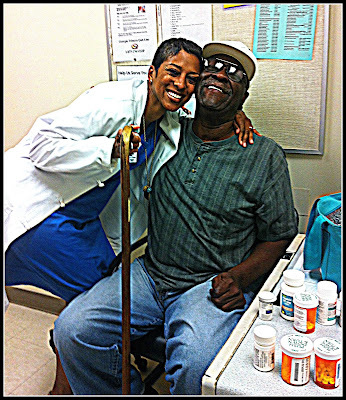 Reflections of a Grady Doctor: Like home. It is such a blessed thing to feel like that about your work and about giving service to folks who need it, and need you. Truly, you have been called. It so plain to see and so magnificent to be privy to. Beautiful post. Thank you. What Angella said. A beautiful post, a beautiful man and your smiles - they made me happy. I'm so glad you found your home. I love this post. It's a joy to have a job that you love, one that you feel makes a difference in this world. That's what I loved so much about being a teacher. Every day brought something new and exciting. And like you, I got as much as I gave. Maybe it's a calling that we have. Whitney sang her heart out, didn't she? Though, I must admit, when Diana Ross sang it in "The Wiz", she knocked it out of the park!! It's wonderful that you have this relationship with your patients. Now, about that "ugly-cry" of yours. Didn't Claire just advise you not to go there? Yay! Happy Gradyversary! You are both, indeed, lucky to have one another-so very lucky indeed. I only made it 1/3 of the way through this post before my vision started blurring badly. I share your love of medicine and consider myself very lucky, because despite the arduous road I have had to travel to get this far (and I have yet to arrive), to feel this calling, to have your heart filled with such love of your chosen profession is one of the greatest joys of life.